Today am going to review a new favorite perfume that I have been using recently. I got this in one of my MSM boxes and it was lying around for a long time untouched as am quite picky about my fragrances. When my Victoria Secret perfume got over, I thought of opening this one. To my surprise, I really liked the fragrance from the first use. So I thought of reviewing it in detail. 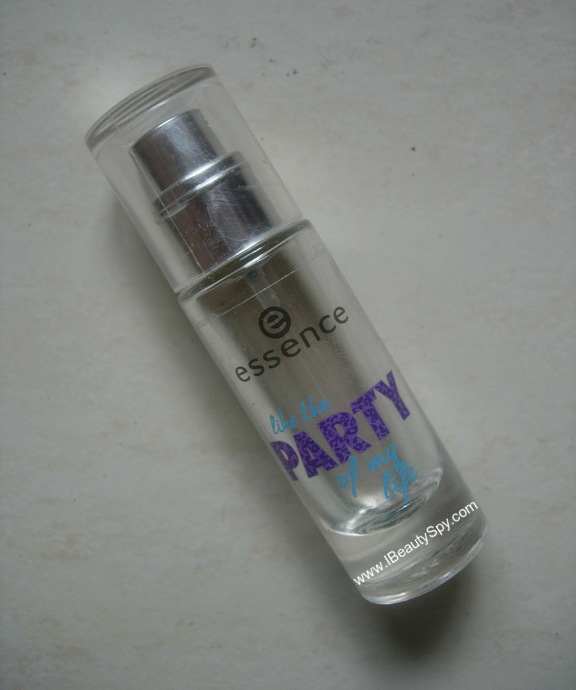 Read on to know more about Essence Like The Party of My Life Eau De Toilette. 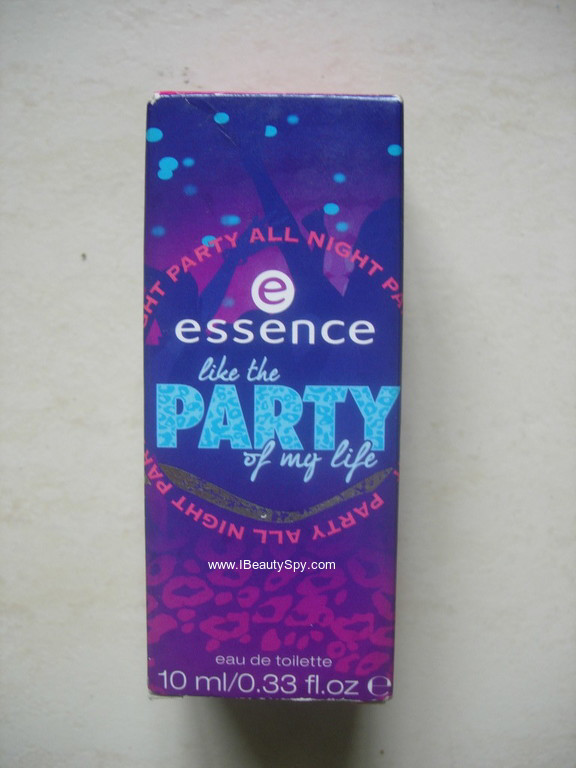 The Essence Eau de toilette Like The Party Of My Life reminds you of those crazy party nights that should never end! Capturing the exuberance, fun and great times, this vibrant, floral yet mysterious fragrance pleases your senses. It contains the freshness of citrus fruits, jasmine, rose and sweetness of vanilla as well as long-lasting scent of musk. This perfume stays for a long time, leaving around subtle hints, as it settles down. The cheerful, fruity notes ensure a great mood. The adorable mini packaging makes it perfect for any travel. Starting with the packaging, Essence Like The Party of My Life Eau De Toilette comes in two size variants – 10ml and 50ml. While the 50ml has a more pretty packaging, the 10ml comes in a simple transparent bottle with a spray mechanism. I like the fact that they have a 10ml variant as it is very compact and can be easily carried in your handbag. Essence Eau De Toilette Like The Party Of My Life is a very young and chic fragrance. It starts with a fruity vanilla scent and then mellows down into a musky, woody fragrance. As the name mentions ‘Like The Party Of My Life’, its exactly like that – fun, frolic and chic. I don’t think it will suit older women. But it can be worn by those in twenties. For me, whenever I spray this, I go into a fun, cheerful mood and feel more youthful. Yes, I believe fragrances can actually change our moods! Though its a party fragrance, its not too overboard. I wear it every day to my office too. It just feels cheerful. The lasting power of Essence Eau De Toilette Like The Party Of My Life is kinda okay. It lasts for around 3-4 hours. But even afterwards you can feel subtle hints of it now and then. * Comes in a mini packaging that is great for travel. * Fragrance puts you in a fun, cheerful mood. * Makes you feel chic and young. * Lasts for a decent 3-4 hours with subtle hints even afterwards. * Doesn’t smell like a cheap perfume. Yes, but not for older women. Its affordable and great value for money. 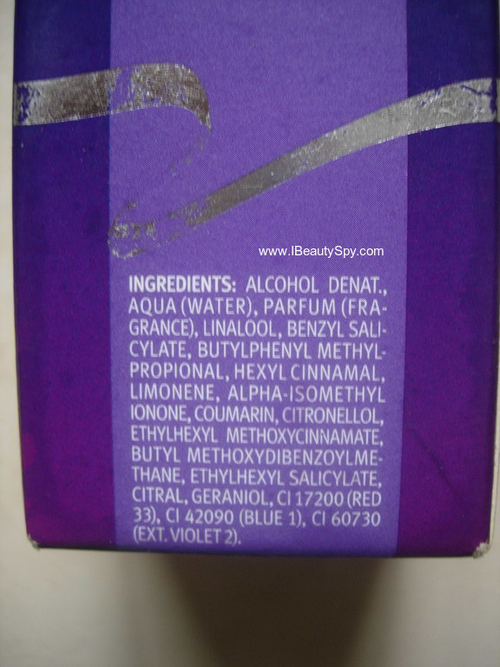 Overall, from my rating, you would have known how much I like this Essence Eau De Toilette Like The Party Of My Life. As I said, am very picky when it comes to fragrances. And this is one of those very few perfumes that have impressed me. Though its a chic, young fragrance, it does not feel cheap. It has class and would definitely suit younger women. I didn’t know essence had perfumes. Looks quite interesting. Looks like this is not a glass bottle! Might be travel friendly too. Where is it available? Online? Yes, it is available on Nykaa. I have given the link in my blog post.